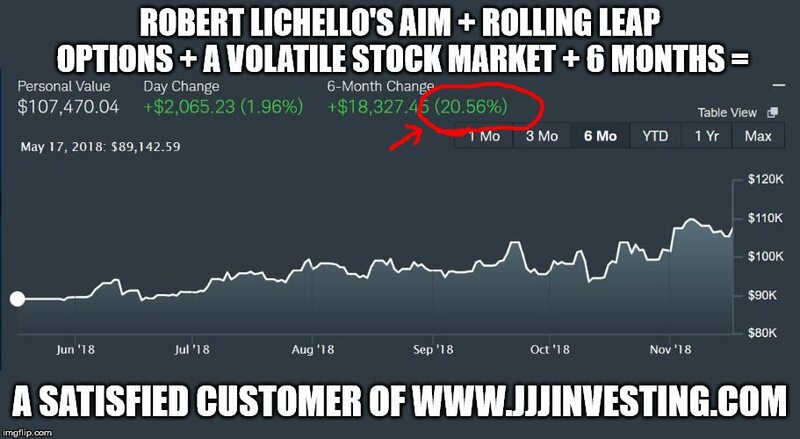 We got an early and unexpected Christmas present from our subscriber Brad S.
Brad has been using the Automated Investing Method or AIM (first developed by Robert Lichello) with long term options or LEAPS as developed by Jeff Weber of JJJ Investing Services. Brad has been using this system in 2018. A six-month chart of his results shows that his portfolio increased by just over 20%. These results are not guaranteed. These results may not be typical. But any system that shows you how to scientifically and automatically buy low and sell high when the market has inherent volatility will have to produce profits over the long term. At JJJ Investing Services, we help investors who want to earn automatic profits over a lifetime. But sometimes we get to see that our system delivers fantastic results within a few months. Thank you Brad for keeping diligent records of your investing portfolio and sharing your exciting results with us. If you want to know what Brad did to earn a 20% increase in 6 months, contact us at JJJ Investing Services. We have several complimentary offers you can take advantage of. Additional Disclaimer: Jeffrey Weber is not an investment adviser and gives only his personal view and opinion, never making any investment advice or recommendation to buy or sell specific securities. Investors in financial assets must do so at their own responsibility and with due caution as they involve a significant degree of risk. Before investing in financial assets, investors should do their own research and consult a professional investment adviser. ← Is it Time to Invest in Marijuana Companies?